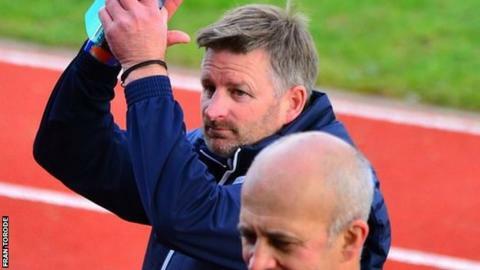 Guernsey FC manager Tony Vance has hailed the desire of his squad after they held out with 10 men to beat Faversham Town 2-0 in Isthmian league Division One South. The club have moved up to eighth in the league after five victories in their last six games. "I'm very proud of the lads and the way they dug in," Vance said. "The performance levels, the desire, the attitude not to concede a goal was immense," he told BBC Radio Guernsey. Vance was particularly pleased with how his side's defence, which was once again changed, coped after Blair Howitt's dismissal with 12 minutes to go. "We've got to give some credit to someone like Josh Steel who's been thrown in at centre half," added Vance. "Yet again we've had to put a back four together that's different, but as a unit they were outstanding, protected in front by the midfield and we broke away very well."